When you think about the factors that make a car worth owning, one that is as important as any other but never seems to get enough attention is the interior, since that's where you actually drive a car. 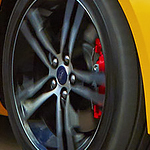 One car at Mullinax Ford of Kissimmee that stands out from the crowd as a popular compact performance hatchback for this reason is the Ford Focus ST.
What is it about the interior of the Ford Focus ST that makes it so stylish? For one thing, the steering wheel comes with a very attractive perforated leather wrap that displays an ST badge right near the bottom of it. That isn't the only high-end touch you can find in the interior of the Ford Focus ST. The manual transmission shift knob is made of the strongest carbon fiber if you select the ST3 package. That same carbon fiber is also on the door and brake handles.